Commercial pools and spas are typically regulated by the health department and a bad leak can trigger a shut-down by department inspectors. What’s more, leaks can make proper chemical balance and water-level maintenance nearly impossible, leading to motor burn-out, high acid levels, and plaster deterioration. Our technicians isolate and pressure test all of the plumbing, diving the structure to remove drain and outlet covers, insert plugs, and pressure test the various systems on a complex commercial pool. We also thoroughly inspect the structure using a non-staining dye-testing method. 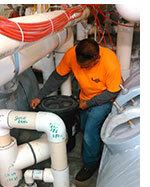 Once the work is complete, we provide a detailed report and a written estimate of repairs should they be necessary.